About ten years ago, I had some problems with the generator on my Fly Baby. Recently, the system quit charging again. I've got it back going, but in the process, I learned a bit more about the Delco-Remy Generator-Regulator system. This answered some of the leftover questions from the earlier case, such as what the difference between regulators was. I have assembled this page not only to tell the story of fixing my airplane, but to provide additional reference material to aid others trying to trouble-shoot their problems. Odd sort of confession for someone with a degree in Electrical Engineering to make. But my specialty was power lines; megawatts of power in kilovolt doses, crossing the prairies on shining towers of steel. I hate the *little* kind of electricity...the kind, for instance, that my Fly Baby uses. And the kind that has given me fits over nearly thirteen years of ownership. Generator problems, regulator problems, starter problems, battery problems, fuse problems, fuse-HOLDER problems, wire problems, radio problems, transponder problems, antenna problems. Gahhh. About eleven years ago, I went through a long and difficult process to trouble-shoot a problem with the generator system, which finally led having the power system work right for the first time since I'd bought the airplane. Since then, the charging system seemed to be working fine, except for one time when I ended up replacing the battery with a dry-cell unit. However, last summer, it seemed to be dying again. It wasn't anything definite. It never got to the point where the battery got so low that the plane wouldn't start. But there was no question the voltmeter wasn't rising as high as it should, when the engine was running. I started putting the battery charger on it for a few minutes before rolling out of the hangar, just as a precaution. Finally...well, things just plain seemed dead. The voltmeter never rose past about 12.5 volts, and by the end of each flight, it was usually down to 12 volts even. With a good dose of wishful thinking, I was suspicious of that dry cell battery. The "book" on it said fully-charged voltage was 12.8 (vs. 13.5 or so for a conventional battery). And, doggone it, the volt meter *did* occasionally seem to come up a bit, in flight. Why was it wishful thinking? Because the two alternatives were of rather more dire consequences. I'd gone through considerable effort when the generator had gone bad...removing the magneto to even be able to unbolt the generator, finding someone local to work on it, etc, getting an A&P to re-time the engine when the magneto came back on, etc. The other option was a bad regulator. While seemingly stock automotive units, replacement regulators bought at the car-parts-store just didn't work last time. I had bought an aircraft regulator at the Arlington Flea Market, but wasn't sure if it worked or not. Finding a new regulator, if the old one was bad, seemed problematic. So... finally, this weekend, I decided to bite the bullet and find out what was wrong. I metered the heck out of the various wires, checked out the switches. All OK. Strongly suspecting the generator was bad, I wired it up to bypass the regulator, as I'd originally done (more description below). I started the engine. A check of the voltmeter showed... 8 volts? This is actually good sign. It showed that the internal wiring of the generator still seemed to be working right. I ran the throttle up slowly. And, thank goodness, the voltage came up, reaching about 15 volts by about 1800 RPM. Shut down and breathe a sigh of relief. Roll the plane back into the hangar, and replace the old regulator with my flea-market replacement. Button up the airplane, don flying togs, hop in, crank 'er up, and taxi out. On runup, voltmeter showing about 12.8V, higher than it had been before. Onto the runway and takeoff. On climbout, I glance down at the voltmeter and have a bit of a scare. The needle looks WAY high. Being a bit skittish, I turn on the lights and strobes. The voltmeter comes down to about thirteen and a quarter. So...dodged a bullet this time. Wasn't the generator, and the old regulator I had on hand was perfectly functional and got the system capability restored. Part of the trouble-shooting process this time was doing a whole lot of research online. The last time around, I got things working, but didn't really understand a lot of the nuances. With all the data on the web, it really didn't take long to find good writeups on how these old generator systems work. I found a great resource, a site called the "Second Chance Garage." It's a how-to site for car restorers, and they've got a lot of great artwork showing how both generators and alternators work. Of specific interest were their generator and alternator page and their regulator page. Please take a look at them to get some of the fundamentals. Now, let's look at the aspects of most interest to owners of small Continental engines with electrical systems. The site that has that image, Vernco.com, provides a detailed guide to how to tell whether your generator has an internally or externally grounded field...and a bunch of good other information as well. My Fly Baby's C-85 mounts a Delco-Remy generator with an externally-grounded field. 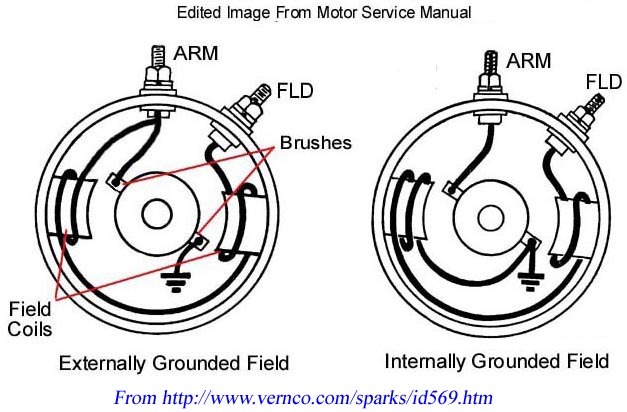 The Delco generator service manual discusses both types (it refers to the internally-grounded type as having a "bucking field coil. "), but says the externally-grounded one "...is used in a wide variety of applications having low to moderate current output requirements." Sounds like the typical C-85-12. Since I have an externally-grounded generator, I'm only going to address those types. If you've got a C-85-12E like me, it's probably a good guess you have the same type. But it's your call. Why Were the Regulators Different? If you read the tale of my earlier generator woes, you'll see that I bought a new regulator at an auto supply store, but it didn't work. 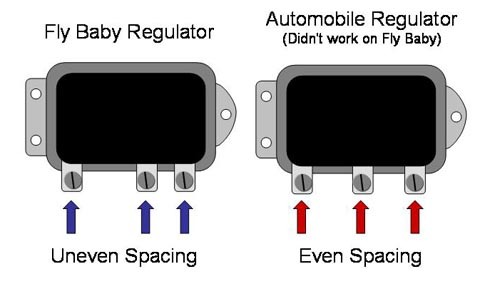 Eventually, I noticed that the spacing of the terminals were different, as shown by the drawing on the right. Why didn't it work? Didn't know at the time. I had taken the old Fly Baby regulator to the auto repair shop, and they'd announced it was bad. The new one tested out OK, but refused to work on the airplane when I finally got the generator running. I shrugged it off, back then...after all, my system was back working again. My Fly Baby's regulator is what Delco calls a "Three Unit" type, vs. the Auto regulator which is a "Two Unit" type. The difference? 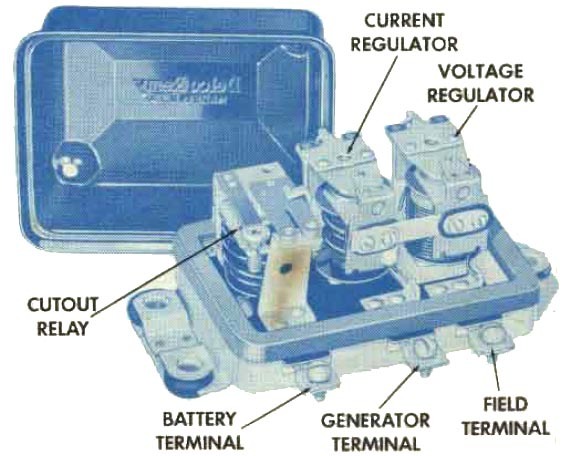 The "Units" refer to the number of control relays inside the regulator. Both have a cut-out relay and a voltage regulator relay, but the Three Unit type adds a current regulator as well. 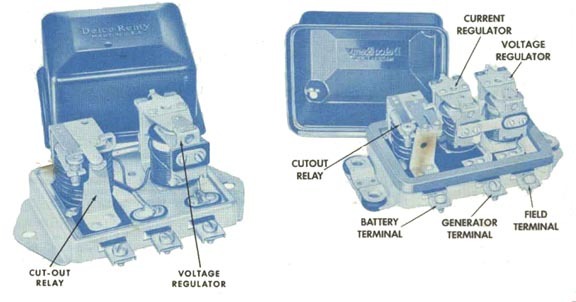 Because the current limiter is connected to the voltage regulator by a bus bar, the terminals associated with the two relays are closer together. Operationally, though, what's the difference? It's pretty simple: The two-unit type was designed for a three-brush generator... the third brush design means the generator doesn't need an external device to limit the current output! Take a look at these illustrations from the Delco regulator service manual. No wonder the two-unit one didn't work in my airplane...and the airplane one failed the test for a two-unit type. The Delco Service Manual for the Three-Unit regulator says, "Regulators covered in this bulletin are most often used on aircraft and 24-volt applications." This leads to one problem: because the three-unit regulator has a current limiter circuit, there's no such thing as a "universal" regulator. The regulator used has to have a current limiter setting that matches the maximum current that the generator is designed for. So there's not a "one size fits all' solution for regulators: Your replacement either has to have the same part number as your old one, or be listed as the matching regulator for your specific generator model number. I'm actually sweating this a bit, in my case. My flea-market regulator *is* a different part number than my old one. I'm keeping an eye on the voltmeter and ammeter, and will shut the generator down if it looks like things are going haywire. On the positive side, the only time the current limiter comes into play is if the plane is drawing a LOT of power during operation. I don't have a landing light or any other large users of power. The starter, yes, but my engine starts quick enough that it doesn't pull the battery down very far. All right, your aircraft isn't charging. There are three main suspects: The battery, the generator, and the regulator. Before you stick those usual suspects under the spotlight, consider a more subtle foe: Loose wiring. Go through the system, and make sure all the wiring is clean (e.g, no corrosion) and tight on their connections. Don't forget the ground connections, especially... I had a car that was giving me fits, once, then I discovered the cable from the engine to the car frame was loose. Not off...just loose. So check the wires, first...they're the cheapest thing to fix, anyway. Aircraft batteries, like car batteries, don't last forever. I live in Seattle, a very mild climate, and get about eight years on a car battery. Back when I lived in Colorado, it was more like three years. Aircraft batteries have it pretty rough; they tend to sit around a lot rather that getting daily discharge/recharge cycles like a car battery. I used to get about three years on aircraft batteries here in Seattle. I'm currently have about 3 1/2 years on my current battery, so it was under suspicion in my recent troubles. It's usually pretty easy to tell if the problem is in the battery. If you have a voltmeter in your airplane and it's showing a good healthy 14V or so when the engine is at cruise power, then the charging system is good, and the battery itself is probably to blame. In any case, if the voltage is *ever* higher than the battery itself, the generator/regulator system is probably not the problem. Batteries generally go bad by losing the ability to hold a charge, so the best way to check them is to use a battery charger. Disconnect it from the airplane and charge it up. It should show about 12.6 volts for a conventional lead-acid battery... less for some battery types. Go online and find the specs for your battery. Let it sit overnight or even for a couple of days. If the voltage is down significantly, the battery probably needs replacement. Assuming it held its voltage, your problem may be that something in the airplane is secretly sucking down power when you think the switches are all off. When you re-install your battery, only connect the positive terminal. 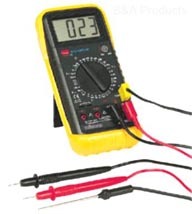 Take your portable voltmeter (I recommend a DVM - digital voltmeter - as shown to the right), and switch it to the current-measuring mode with the highest reading scale. Make sure all the switches in the airplane are off. Then touch the red (positive) probe of the meter to the aircraft battery cable, and the black (negative) probe to the negative terminal on the battery. The meter should read zero amps. If it does, reduce the scale of the meter to ensure that there's not a little trickle of current (DVMs usually have only one setting, and auto-range to give the most-accurate reading). If you DO find that current is being drawn from the battery even with all the switches turned off, that means that something isn't really "turning off." It's sucking the life out of your battery as the airplane sits. A good example is a clock, which has to have continuous power to keep working. Their power draw is usually a tent of an amp (0.1 amp) or less, so they're generally not a problem unless the plane sits for a long time. The trouble-shooting process in this case is to disconnect electrical gear, one unit at a time, until the ammeter shows that the unplanned power draw is gone. A final note on the battery: They most often go bad if they inadvertently get fully discharged. So if you left the master switch on and came back to a dead battery, don't be surprised if it's PERMANENTLY dead. Is It the Generator or Regulator? 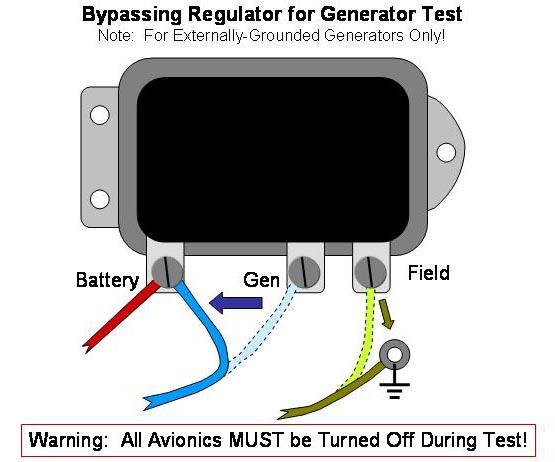 Assuming the battery is OK, the wiring is tight, and the plane's voltmeter doesn't rise over the battery voltage in flight, then either the generator or the regulator is bad. But which is is? Fortunately, there's a relatively quick test that will bypass the regulator and tell you whether the generator is capable of producing power. WARNING: This has the potential for doing serious damage to your plane's electronics. Follow all precautions. See Ron's Horror Story below. The procedure is ONLY for generators with externally-grounded fields. Note that you MUST have a voltmeter installed to run this test...or a DVM hooked up so that you can read the main bus voltage. Ensure the power is turned off to all electrical devices in the aircraft. Remove the fuses or trip the circuit breakers, if convenient In fact, my advice is to disconnect them entirely (see below). Disconnect the wire that goes to the "GEN" terminal (sometimes marked "ARM") and connect it to the "BAT" Terminal (sometimes marked "Battery" or "12V"). Disconnect the wire on the "Field" terminal (May be marked just "F" or "FLD") on the regulator and connect the wire directly to ground. As of this point, the "GEN" and "Field" terminals of the regulator should have nothing connected to them. Make sure the wheels are chocked. Get in the airplane and remove the fuse/pull the circuit breaker that controls current to the generator. Turn on the master switch. Verify, again, that all power is off to the aircraft electronics. Enable the generator (turn the second half of the split master on, insert fuse, push circuit breaker in, etc.). Watch the voltmeter. With the engine idling, the voltmeter will probably be reading less than 12 V.
As the RPM increases, the voltage should also increase. Try not to let the voltage rise above ~14.5 volts. So: If the voltage DID rise with RPM, your generator is functioning. If it got above 14 volts, it's probably fine and the problem lies in your regulator. The strange thing is, if you download those Delco-Remy Regulator Service Manuals, they give instructions on how to service and adjust the regulators. I'd really recommend just a replacement, though. If the voltage didn't come up, then your generator is bad. Removing the generator isn't too hard, but you'll have to remove the left magneto to get at the top nut. You can often get these generators rebuilt at local auto electrical shops, but many will not touch aircraft generators for legal reasons. Don't volunteer that it came from a plane... just ask if they can check out an old generator and rebuild it if necessary. OK, I followed the instructions above. I disconnected the regulator, and made sure my radio and transponder were both turned off AND their circuit breakers were off before starting the engine with the regulator bypassed. The voltage didn't rise much above 14 volts. But...when I replaced the regulator and connected everything back up again, both the radio and the transponder were dead...they didn't turn on. Fortunately, the condition wasn't permanent. The radio powered up on the second time I pressed the "On" switch. It took the transponder a couple of minutes, but it, too, finally powered up. Both have been working normally since. So what happened? Beats the heck out of me. I installed both those units, and know darn well that the combination circuit breaker and power switches kills the connection to the +12V bus. They *maybe* saw the aircraft ground via their antennas...but there was still no connection to the positive side. But if I ever have to run this again, I'm going to physically unplug them. If your generator goes bad, you might be able to get it replaced. If the regulator conks out, you might be able to find a replacement unit. But there are two modern alternatives. For the regulator, Zefttronics sells a Generator Control Unit that is a direct replacement for the old Delco-Remy regulators units. These are about $150. For BOTH the generator and the regulator, Plane Power sells a conversion kit that replaces the generator with an alternator (lighter, more power) and includes a solid-state regulator. Cool set up, love to do it someday, but we're talking about $700 or so. Second Chance Automotive Generator and Alternator page. Details on how they work. Second Chance Automotive Regulators page. Perry Ruiter's Motorcycle Restoration Site. Includes several service bulletins for Delco-Remy regulators.